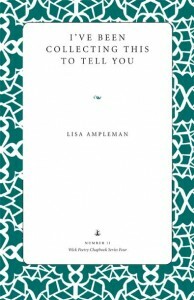 AuthorLisa Ampleman is a Ph.D. student at the University of Cincinnati,. Her poems have appeared in journals such as Cave Wall, Forklift, Massachusetts Review, and Notre Dame Review. She is a Dorothy Sargent Rosenberg Poetry Prize winner and 2011 Ruth Lilly Poetry Fellowship finalist.